With information about the tragedy coming out by the minute, we now know several of the weapons the Las Vegas shooter used. In his hotel room at Mandalay Bay Casino, there were nearly 23 weapons, which included semiautomatic rifles, scopes, and hundreds of rounds of ammunition, which could be legally purchased in the state of Nevada. Here are actual photos of 2 of the 23 guns found inside of the room. According to reports on the scene, most of the guns were semi-automatic assault rifles, with only a few being handguns. Also, two of the rifles had tripod and scope modifications, which greatly enhanced the shooters accuracy. Another 19 weapons were found at the shooter’s Mesquite, Nevada home, which is about an hour drive northeast of Las Vegas. How the terrorist acquired the weapons is currently still under investigation. The AR-15, which is pictured above, was enhanced with slight modifications, such as ‘bump stocks’, which cost as little as a hundred dollars. They make the trigger move very fast, almost automatic like. In the room, thousands of rounds of ammunition were found, ranging in caliber from .223 to .308, which are ideally used for hunting rifles. Even though the total exact extent of the killer’s hotel room arsenal is not completely understood, we do know a large majority of the kind of weapons he used to carry out the attack. 1)Four DDM4 semi-automatic rifles, which had on a muzzle flash suppressor, making it very hard to tell where the weapon is being fired. These kinds of guns are also ideal for scope and grip enhancement, which the shooter used. They cost around $1,900 if purchased new. 2) Three FN-15 rifles, which also have a muzzle flash suppressor and ‘H buffer system’, which reduces recoil and strengthens accuracy. These rifles look similar to military-issued M16s. At the moment, it is not know what version Paddock owned. Prices range from $1,000 to $2,000 if bought new. 3) At least one AK-47 assault rifle, which has been used around the world since WWII. They are known to be one of the more inaccurate assault rifles, but are highly reliable and simple upon use. They are extremely powerful and retail for a mere $600 in the United States. 4) At least one Colt AR-15, which is the most popular rifle in America. It is estimated that almost 8 million homes around the country have one. 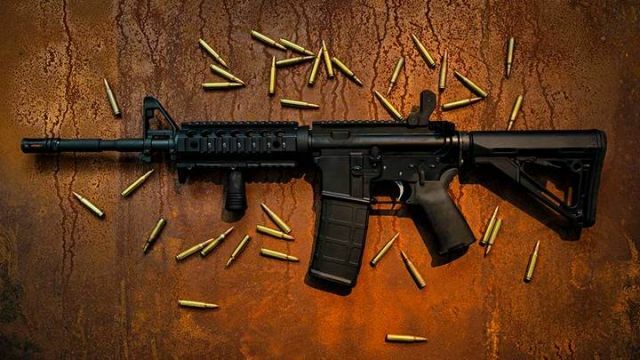 Other mass shooters have used this gun, such as the Colorado theatre shooting in 2014 and the San Bernardino terrorist. They are also ideal for attachments like a scope, as seen in the picture below. 5) As previously mentioned, the terrorist also had two ‘bump stocks’, which made his highly powerful semi-automatic weapons even more deadly. Essentially, they fit over the stock of the rifle and allow the gun to bump back and forth as it is being fired. It uses the gun’s recoil to force the shooter’s finger down on the trigger faster, forcing each round to come out noticeably faster. Authorities are still investigating to see whether some these semi-automatic guns had illegal modifications, unlike the ‘bump stock’ feature, which is completely legal. What are your thoughts on semi-automatic guns? Do you think they should be legal? Do you own any? Let us know! Hey Buddy!, I found this information for you: "Weapons Used by Las Vegas Terrorist". Here is the website link: https://www.thealternativedaily.com/weapons-used-las-vegas-terrorist/. Thank you.